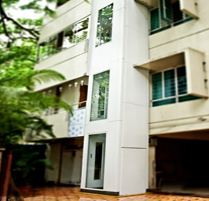 They are designed to suit every construction requirement, with trouble free performance and low maintenance cost. Single speed lifts operate at a maximum speed of 40 meters(130 ft) per minute powered by specially designed lift duty Single Speed motors. 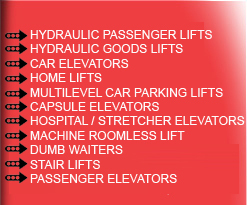 High Speed lifts are manufactured with self leveling devices. Within a given speed range, floor leveling is adequate for normal passenger capacity. as per I.S. The Lift Control System can be of Car Switch or Automatic Type. The Car switch type is for operation by an attendant, whereas the Automatic type comprises of feather touch buttons at each landing which call the lift car and a series of buttons in the car which correspond to the floors to be served and operated by the passengers using the lift.